"A good communist finds use for everything, and nothing is more useful than a useful idiot." Over the last two weeks, Pamela Geller and I have come under fire by the propagandists, ground feeding "useful idiots" in Arizona, for exposing their contrived and purposed lies. In response, we packed up and took our Gospel message into the enemy's own backyard (Exodus 23). The state-controlled media were attacking Geller for simply calling out un-American and dangerous organizations such as Hamas-CAIR for what they are and for what they are attempting to advocate. However, these "reporters" strain at the gnat while they swallow the camel; and that's to their own demise, as well America's, if they continue to tolerate these. Geller gave her report of how she overcame the Arizona chapter of the Council on American-Islamic Relations' attempt to keep her from speaking to the Red Mountain Tea Party. Those attempts included issuing death threats. Even though Geller was clear in her position and in exposing Islam, reporters continued to paint her in a bad light. Phoenix News Times reporter Ashley Cusick wrote of Geller's meeting: "In the end, the tension was far greater online than at the event itself. No one came out to protest Geller's speech and there was no security to be seen at the school. If people indeed brought guns, they weren't visible." According to the report and the pictures from the event, hundreds of people turned out to hear Geller at the Red Mountain Tea Party event. In fact, Cusick wrote, "[Geller] paused to allow for audience laughter, before calling CAIR an un-indicted co-conspirator in the September 11 attacks." Does it not amaze you that these "useful idiots" (An "idiot" is defined as a dolt or dullard, an intellectually disabled person, or someone who acts in a self-defeating or significantly counterproductive way) withhold the truths concerning the threats that expose the enemies for who they are? Are we now going to hear denials that 9/11 ever happened? Are we to suggest that nobody is responsible the terrorist attacks on Sept. 11, 2001? These "useful idiots" attempt to omit the crimes that these organizations are responsible for (or their ties to the organizations that are responsible for the crimes) and instead throw unfounded accusations at those who are calling them out for what they are. Regardless of their less than 21 percent approval rating, they continue to dig the hole that they will at length fall into (Psalm 7:15). Concerning her hit piece she put out on me, it was clear that Ms. Cusick was attempting to make me look like the bad guy, writing that "[Dean] heads an organization found on the Southern Poverty Law Center's list of hate groups" in her first paragraph. Ms. Cusick is also apparently fine with allowing the SPLC's claim about me to stand without question. And why should she question it when their methodic attacks are to "shout and shoot"? She cited the SPLC's claim that I am "rabidly anti-***" and said though my "speech indeed centered on his view that Judeo-Christian values must remain at the center of American democracy, ... there were tangents." Second, it seems Ms. Cusick is attempting to cover for the very people who support the "Homosexual Manifesto," but apparently she doesn't consider the language of that writing to be "hateful." Not once did this "useful idiot" make reference to the hateful statement of SPLC Director of Intelligence Mark Potok, who said, "Sometimes the press will describe us as monitoring hate crimes and so on. ... I want to say plainly that our aim in life is to destroy these groups, to completely destroy them." It was Potok's organization's "hate list" that provided a map for Floyd Lee Corkins to attempt the murder of a guard at the Family Research Center with the desire to kill as many people as possible and smear Chick-Fil-A sandwiches in their faces. Cusick also made it a point to nitpick my reference to Obama as "Hussein." Why that would be a big deal, one can only guess. After all, it is his name. Is she offended that his Muslim name is being used? To her credit, yet in contrast to her intent, I am sure she did rightly point out that I exposed the workings of Obama being right in line with dictators like Adolf Hitler, Mao Zedong, Benito Mussolini and Joseph Stalin. Finally, she mentioned where I called her out in front of the audience and put her on notice that I would sue her if she misstated me or took my words out of context. "Dean isn't playing around," she wrote. I filed a $50-million lawsuit for defamation against MSNBC host Rachel Maddow when she manipulated my words as though I was calling for the murder of sodomites. Noticeably missing from Cusick's report was anything of the history of America or how central Christianity and the Bible was in its initial founding or throughout our history, which is the warp and woof of my message. Nowhere does Cusick speak of how the founders dealt with sodomites. Nowhere does she show any concern for the children in America's public schools who are lied to day in and day out. And that's where she misses the real message. It's a shame that Ms. Cusick is contributing to the downfall of the nation by not reporting on the real threats to America, yet she is actively seeking to tear down those who are fighting against America's enemies (Proverbs 23:23). 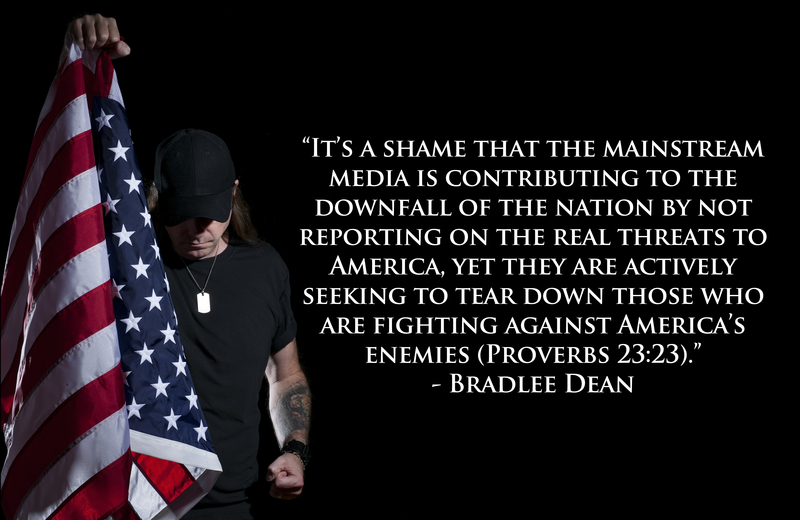 Listen to Bradlee Dean each weekday and Saturday at SonsofLibertyRadio.com and get the news the state-run media won't give you at SonsofLibertyMedia.com.